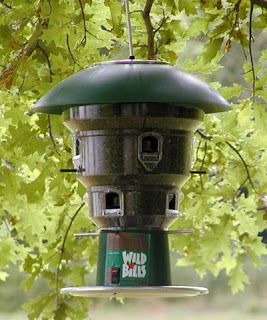 Squirrel shockers definitely belong to the group of the most efficient squirrel proof bird feeders. Having in mind terrific reviews and great acceptance the most of the shockers of this type have, one can conclude that electric anti-squirrel feeders share the hall of glory side by side with spinning bird feeders. What exactly are squirrel shockers? Squirrel shockers are electrified bird feeders charged with electric batteries able to produce low electric current, usually under 50 mA (milliamperes). Thus, the electric current is not capable of killing the animals. It gives the animals small electric shock instead, without even fainting them. Think: cows behind electrified fence. It is pretty much the same concept. How come squirrel shockers work so well? It's because their efficiency is based upon basic biological mechanism for all animal species: the learning. We all know how persistent the squirrels are, but in spite of that and after like 20 electric shocks in a row, every single squirrel will give up trying. The learning principle of trial and error is the very point in this case and after unpleasant shocking experience the squirrels will finally get trained not to come close to the bird feeder. Also, it has been scientifically proven that the squirrels do communicate among themselves using means of body language, scent caused by fear and vocalisation, so there's a dubious but reasonable chance that the shocked squirrel will not take its friends to the feast anywhere near electrified bird feeder. Do the birds get electric shock too? Are squirrel shockers safe for birds? Straight answer is: yes! Squirrels do get shocked while the birds don't. Bird's body parts such as beaks, feathers and feet are very poor electrical conductors with much higher impedance than squirrel's body parts. That's why electric current of weak value refuses to run through bird's body. Commercially made squirrel shockers feature well tempered low electric amperage and that's the reason the squirrels get electric shock and the birds are safe from it. Shockers in this group are capable of autonomous recharging without interference or help from your side because they have solar cell integrated in their housing. This type of shocker is convenient for placement on sunny locations without nearby electric power source. The best example of solar powered shocker is "Squirrel-Off" bird feeder. Note: this feeder is currently sold out. Please check the availability at this link. Shockers in this group are suitable for placement in your backyard or any other location with electric power source needed for recharging. Good thing about them is they are independent of sunlight intensity and work without problems in days obscured by overcast or during short winter days. The best reviewed representative of this group is certainly Wild Bill's Squirrel Shocker. I can not stress enough how important it is to place your bird feeder properly. So please, always remember this advice: even the world's best anti-squirrel feeder becomes vulnerable if deployed in wrong or careless manner! How to choose proper pole for your squirrel shocker? Does it really matter what kind of anti-squirrel baffle will you use? If you really wish to get the maximum benefit from squirrel shocker I strongly recommend reading anti-squirrel feeder placement tips from this website.